This weekend was my daughter’s seventh birthday, and she wanted to have a beach picnic to celebrate. Unfortunately, the weather was cold and windy, so we had to move the party from the beach to indoors. No one seemed to mind though, and we all had a great time! 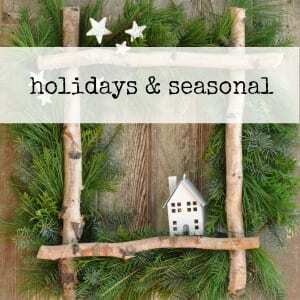 I had planned all the food, decor and activities for the beach, but when we felt the cold wind, we quickly shifted things around to work at home. 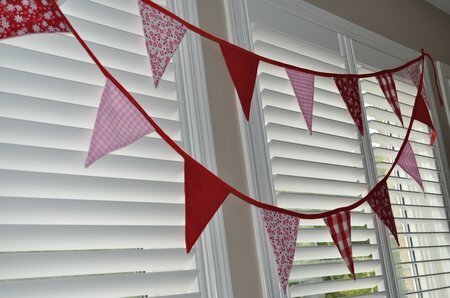 You saw the bunting flag invite yesterday, which was inspired by the bunting flags I made for the picnic. I made some simple bunting flag before with with pinking sheers and ribbon, but this time I made them double sided, ironed them and used seam binding along the top. They look much more professional, and I’m really pleased with how they turned out. They were a lot more work, but it shows. 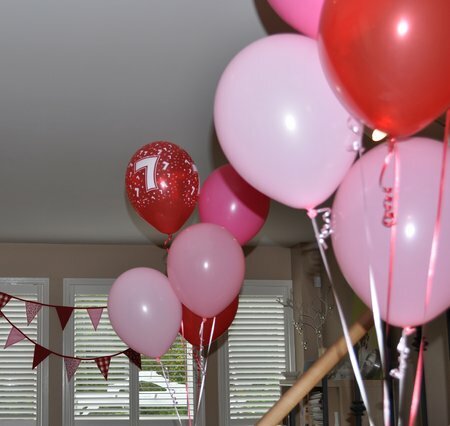 We also had some fun red and pink balloon bouquets. 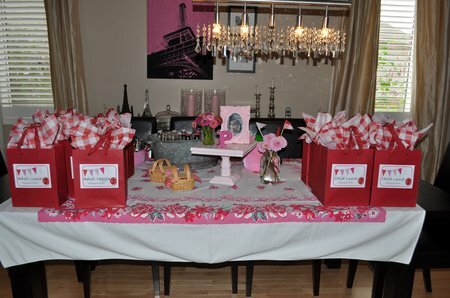 We set the picnic food up in the dinning room. I found this great vintage table cloth at an antique store this summer, and fell in love with it. 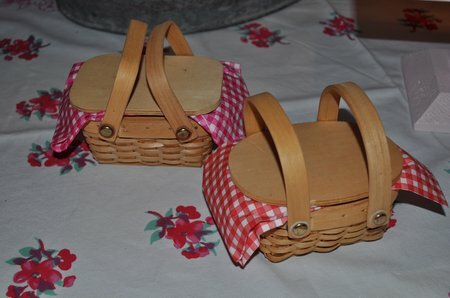 I used these sweet miniature picnic baskets for decoration on the food table too. 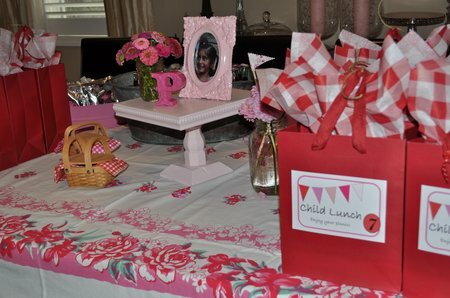 Each guest had an individual picnic bag, the adults were on the left, and the kids were on right. Around the back of the table I set up the drinks. 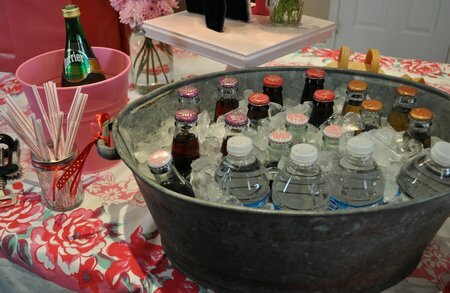 I had fun finding old fashioned pop bottles of cream soda, black cherry, root beer and coke. For the kids there were Kool-Aid Jammers, and lots of water for everyone. 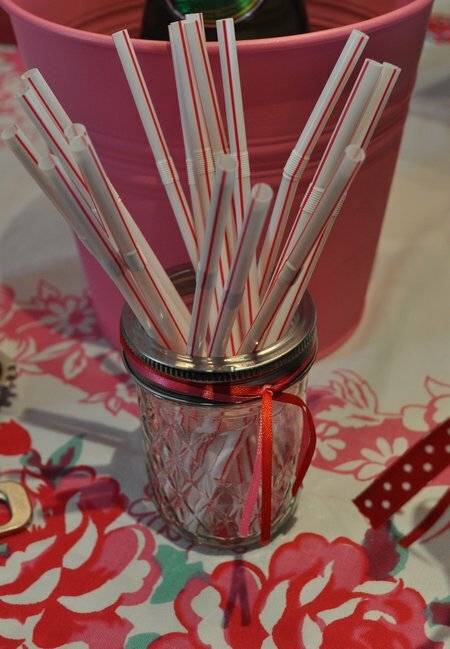 I used a mason jar to hold some striped straws. 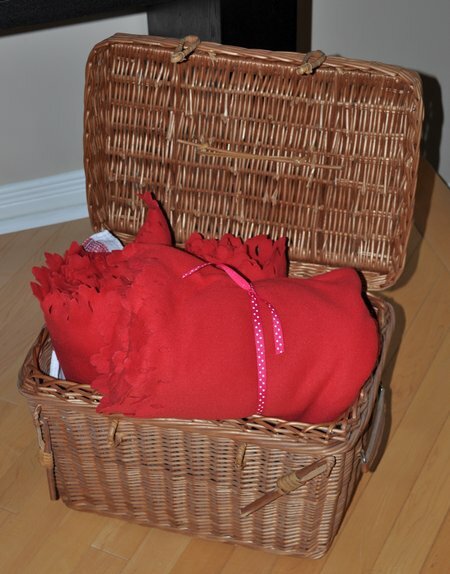 We also had a picnic basket filled with red picnic blankets, that I picked up at IKEA. 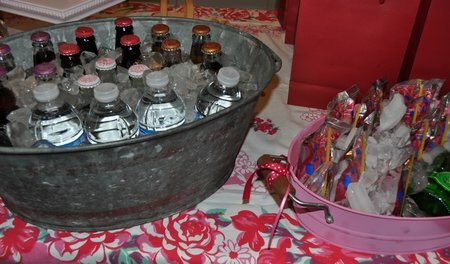 I had also planned a coffee and tea station for the grown-ups, since the party started at 11. 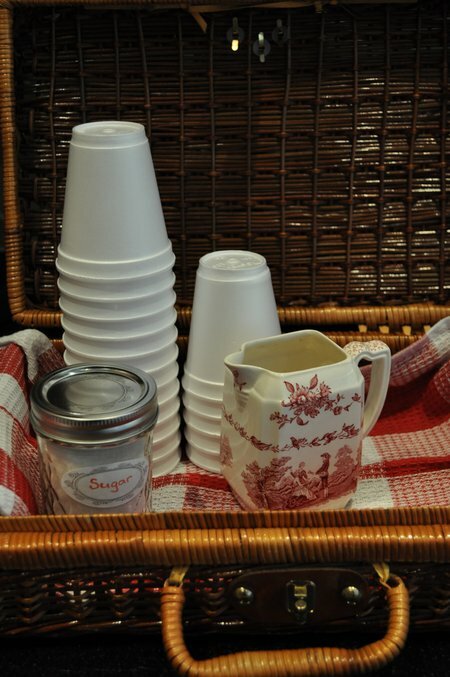 We planned on using thermos flasks for the beach, but since it was at home I just set this basket I’d prepared next to the coffee maker. 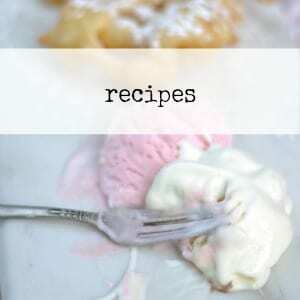 Stay tuned for Part II -the activities, and Part III -the food! 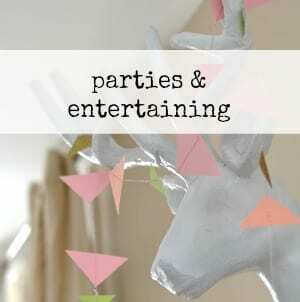 This post is linked up at these great linky parties, check them out for lots more inspiration: Someday Crafts, Blue Cricket Design, Between Naps on the Porch, and Today’s Creative Blog. 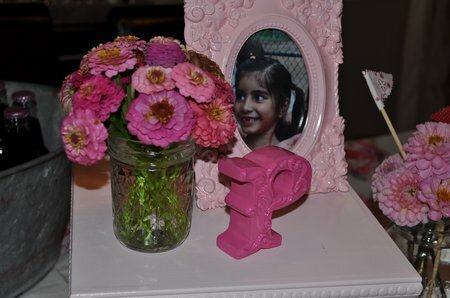 This is so sweet – I love that you make your kids (all three of them!) feel so special on their birthdays. Happy Birthday Miss Paige! 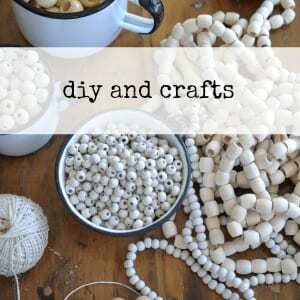 Very creative ideas for the party…a lot of work I’m sure!!! You should go into business for yourself. It’s a real talent you have! Glad the kids had so much fun! Oh, yeah….you thought of everything! You went to town with those pinking sheers, too, didn’t you??!! 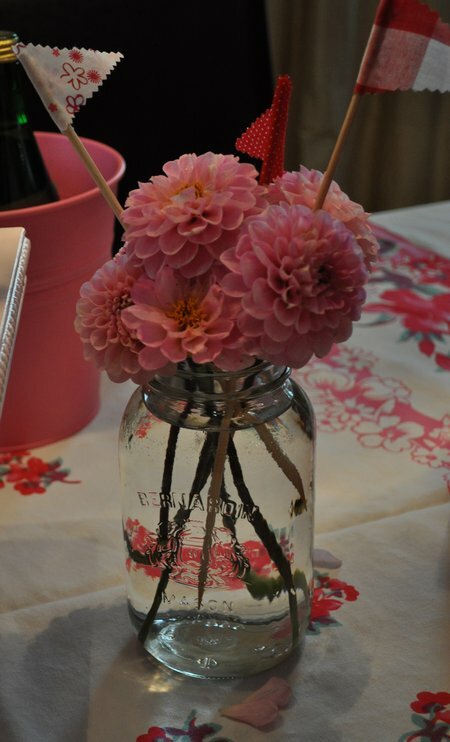 I love the little flags in the floral arrangement that mimic the bunting above the window! 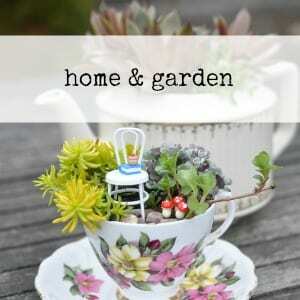 Very cute! The flowers are all so pretty, too. The overall combination of pink & red is very fresh. I’m sure your daughter will remember this birthday for a long time to come! Very nicely done!